Photos by Liz Martiniak ©Liz Martiniak 2002; all rights reserved. 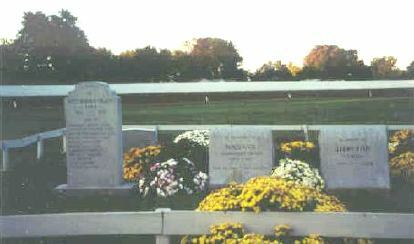 Top: Red Mile Trotting Track cemetery. Benelwyn and Lee Worthy (right). THE RED MILE TROTTING TRACK, called the "world's fastest harness track," was established by the Kentucky Trotting Horse Breeders Association in the late 19th century. The oldest stakes race for trotters, the Kentucky Futurity, was first run here in 1893. 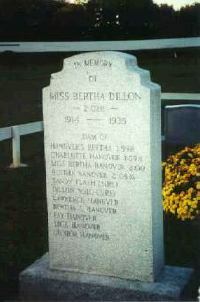 Some of the most noteworthy standardbreds who raced at The Red Mile are buried in its infield, including MISS BERTHA DILLON, BANKER BARKER, LEE WORTHY, AND BENELWYN.